In this episode, we have found our souls reaped following the announcement of the first expansion, Diablo III: Reaper of Souls. After geeking out we get down to business by discussing what we’ve been up to in-game: Breja worked on his tan in Potterville, real life continues to get in the way for Lanntonio, Nevik played with some Hearthstones, and Jen wrecked face with the improved monster density in Inferno (MP1)! * We read, and respond to, a trio of emails we received from our wonderful listeners. This batch comes to us from Commander Bird, Torrack and Smokimus. Thank you for the emails! Keep them coming, really! * We received tweets from @Jaetch, @NoGumeBearSteve (formerly @ecwctechguy), @Torrack1714, @GrandNagus1, @KilroyKT, @JCMonkeyD3, and @Cybrwolf0. Thank you for your tweets. Don’t forget that you, too, can send in your thoughts via social media outlets such as Facebook, Google+, and Twitter. * We posed a question on Twitter seeking your thoughts on the recently announced expansion Diablo III: Reaper of Souls. We received many responses from our listeners and shared our own thoughts on the first expansion. 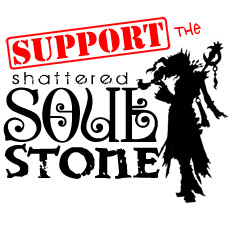 Be sure to follow our show account, @ShatteredStone, on Twitter for future Questions of the Show. * With the announcement of the Reaper of Souls we discussed, at length, some of the lore revolving around the first expansion and how the Book of Tyrael will serve as a “bridge” between the close of Diablo III and the beginning of the Reaper of Souls. We’re really looking forward to digging into the juicy lore tidbits contained within and fortunately the Book of Tyrael is now available for pre-order! * While we didn’t cover absolutely every shred of news that came out of Cologne, Germany this past week, we did discuss some of the major points of the Reaper of Souls. If you’re looking to dig into absolutely everything known at the moment, head on over to DiabloFans for their massive expansion recap. * We introduced a new segment to the show featuring the reenactment of a humorous forum post on the Official Diablo III forums. We are hoping that this new segment inspires some of our listeners to record themselves reenacting some gems from the forums that they find. If this strikes your fancy, send your Official Forum Thread Masterpiece Theatre audio segments to Show@ShatteredSoulstone.com. This episode’s Official Forum Thread Masterpiece Theatre segment bed music included Rondeau from Sinfonie de Fanfares by Jean-Joseph Mouret and Pannonia Boundless by Alexandra Vrebalov. * If you missed out on being present for the unveiling of the Reaper of Souls and the subsequent presentation, fret not! PlayersCutTV has you covered with this remarkably high quality recording of the presentation. * PlayersCutTV also sat down with Josh Mosquiera at Gamescom 2013 and sine interesting lore tidbits were to be had during the interview as well as a hint that we might see a beta for Reaper of Souls this year! * Athene, the self-accredited world’s best gamer, also had an opportunity to interview Josh Mosquiera and Christian Lichtner which posed some interesting answers in relation to the state of PVP, Nephalem Trials, the length of Act V, the Crusader and potential for more classes, and more. * PCGames.de had an opportunity to interview Brian Kindregan and Kevin Martens about the lore, setting, improved itemization, new game systems and mechanics of the expansion. * Finally, as a palate cleanser, Blizzard revealed the TV commercial for the console version of Diablo III launching September 3rd on Playstation 3 and Xbox 360. This episode’s song of the show features the amazing work of composer Oscar Araujo on the soundtrack to Konami’s fantastic Castlevania: Lords of Shadow which launches for PC computers on August 27th, 2013. If you haven’t played this game, we highly suggest that you do as the soundtrack for it is absolutely breath-takingly stunning. Originally the soundtrack was only available with the collector’s edition of the console versions of the game but is now, fortunately, available for purchase on iTunes. You can find more amazing work by Oscar Araujo on his official website or on his profile page over at SoundCloud.